The box set of all 3 volumes of the "The 7-Day Ketogenic Diet Meal Plan" is now available. A ketogenic diet is designed to make your body burn fat instead of carbohydrates. It is comprised mainly of a high fat diet with low carb foods and normal levels of protein. The book provides you with 21 daily ketogenic diet meal plans. That's a full 3 weeks of meals that are planned out for you. This collection contains 105 recipes to help you organize your meals that will turn your body into a fat burning furnace. The daily meal plan is organized into the following: breakfast, snack, lunch, snack and dinner. Each recipe, where appropriate, is geared towards a family of four. You can alter the amount of ingredients used to accommodate any number of people as needed. A recipe for 'Keto Rolls'; this recipe serves as a great substitute for those missing the taste and feel of bread without adding on the additional carbs. A free printable version of the meal plan and shopping list. A recipe for 'Keto Almond Bread'; this recipe serves as a great substitute for those missing the taste and feel of bread without adding on the additional carbs. A recipe for 'Posh Coffee'. On those mornings where you don’t really feel like something to eat, substitute it with this thirst quenching and tasty coffee. 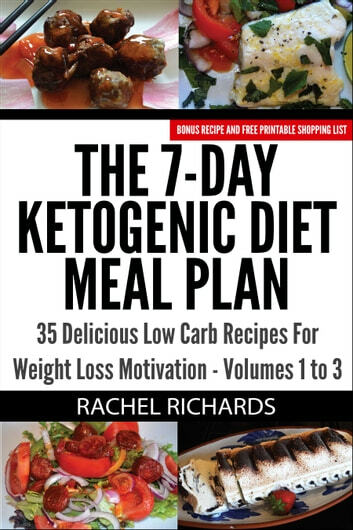 Download this book now to enjoy your ketogenic diet meal plan.